>> Insurance Note: If you live in “high-priced” state like AZ, Calif., IL, NJ, PA, FL, TX or WA, OREP does not limit coverage/raise E&O rates. E&O/GL rates the same in all states where program is offered. Same day coverage. Editor’s Note: According to home inspector attorney Joe Denneler, although no two claims are exactly the same, one common element is a lack of effective communication in some form. 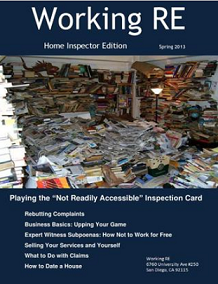 I’ve had the distinct pleasure of defending home inspectors in litigation for many years. I’m often asked what the common factor is in all of my cases, if one exists at all. Although no two cases are exactly the same, one common element is a lack of effective communication in some form. Unfortunately this is to be expected when dealing with claims against professional communicators. If you aren’t already aware, the primary function of your profession is communication. Inspectors take stock of the visually observable conditions of a structure or system, filter the visual information through their training and experience and communicate their observations and opinions verbally and in a written home inspection report. You can be the very best in your field at detecting defects, but if you cannot effectively communicate your observations and opinions, you simply are not doing your job. Inspectors, like trial lawyers, usually have three opportunities to communicate with their audience. Trial lawyers communicate to a jury through an opening statement, the evidence presented, and a closing statement. Inspectors communicate to their clients through a pre-inspection agreement, a home inspection report and verbally. Your pre-inspection agreement is your first opportunity to communicate critical information to your client. An effective pre-inspection agreement describes the scope of the inspection, the standards of practice being used, the exclusions and, where appropriate, gives notice of certain defenses to claims. 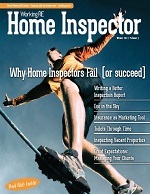 Inspectors in regulated states should always be familiar with the applicable home inspector laws, codes and regulations specific to their state, as they usually provide certain language to be included in the agreement, or may preclude some defenses, such as liquidated damages or arbitration clauses. The written home inspection report is the next communication with your client. Ideally, the report should disclose those systems and components designated for inspection at the time of the inspection, along with systems and components present at the time of the inspection that were not inspected, and the reasons why they were not. It should identify what defects are found in the systems and components, and state the significance of the defect. Communicating the defects in the report might be the most important communication made to your client. I often recommend using a defect summary that gives a list of each defect, the significance of the finding, and describes the action recommended by the inspector to address that defect. Too many times I’ve heard a plaintiff testify that they missed a reported defect or did not realize the significance of a notation within the body of the inspection report. Similarly, I’ve had many plaintiffs testify that they did not read the report “cover-to-cover.” I still don’t fully understand why someone would pay for a report about the most significant financial investment they will likely ever make and then not read it, but it happens. Having a detailed summary acts to eliminate this problem and makes it nearly impossible for the client to later claim ignorance of the defects found during the inspection. Finally, the report should provide recommendations regarding the need to repair, replace or monitor a system or component, or obtain analysis by a qualified professional. Regulated states usually have additional specific requirements for the contents of an inspection report. Verbal communication, while effective, can also become an issue if the relationship between inspector and client goes sour. Since there is no written evidence of the communication, the truth can be muddled by poor memory, time and other factors. Given how verbal communication can be manipulated, it’s best to write down any verbal comments you give the client and save the notes in case they’re needed later to defend a claim. For this reason I have some clients who now record the inspections with audio, video, or both. Technology has made it possible to carry a good digital recording device easily and to later transfer the results to a report or to save if needed. The best example I have of a recording as an effective tool to diffuse claims happened in Pennsylvania. My client used a small video camera which recorded his entire inspection. Months later, the homeowner had an oil leak arising from the copper feed line between the oil tank and the furnace. The homeowner’s insurance carrier filed suit against the inspector, alleging that he missed a broken feed line during the inspection. Within hours of being served with the lawsuit my client produced a video depicting his inspection, and showing the feed line to be intact and no evidence of an oil leak. That case went away quickly and likely saved the inspector thousands of dollars. Symmetry among these forms of communication is necessary. If the pre-inspection agreement specifies a particular set of standards of practice, then the contents of the inspection report should speak to those standards in some fashion. If you are defining “defect” in your agreement you should use the same terminology in your report. Consistent, uniform communication eliminates ambiguity and confusion. If your agreement states that you will report on readily accessible “material defects,” and defines that term, your report should not use different terminology like “major defect” or “action item” to describe the same condition. I can assure you that every time you do that, you run the risk of a disgruntled client later claiming that they didn’t realize that the “action item” in your report was a “material defect” that required certain action be taken by the client prior to the end of the inspection contingency. There is certainly no way to completely prevent claims. If you encounter a risk you cannot prevent, the only way to deal with it is to guard against it. Effective, consistent communication is one tool you can implement immediately to counter the risk of a claim you encounter every time you enter a home for an inspection. It can save you thousands of dollars in deductibles, legal fees and lost time, while improving upon the service you give your clients. Take an opportunity to review your communications. A few minutes can be more valuable than you think. Attorney Joe Denneler provides inspection contracts written to the home inspection standards applicable and specific to your state. OREP members enjoy 25% off these services. To contact Joe or if you’re an OREP member and would like the discount code, email Isaac@orep.org. A well-written and legally sound inspection agreement is the number one risk management tool any home inspector has to avoid and minimize claims. There are many factors to consider, including state and local regulations, association standards and consumer protection laws. If you’re using a generic agreement, or one patched together over many years, it may have elements that don’t include or conflict with superseding state and local requirements. Matching your inspection agreement to the laws specific to your state is critical for preventing misunderstanding and confusion about your responsibilities to your client. When you are defending against a claim, ambiguity and conflict are not good in the one document that can be your best defense. The best agreements are written based on existing state home inspector standards of practice and regulations where applicable. In non-regulated states, they are written to conform to the standards of practice used by the inspector. Along with home inspection contracts, also needed are agreements for ancillary services such as mold sampling, EIFS/Stucco inspections, commercial inspections, and more. You only get one chance to make a first impression. Make yours count. OREP members enjoy 25% off these services. 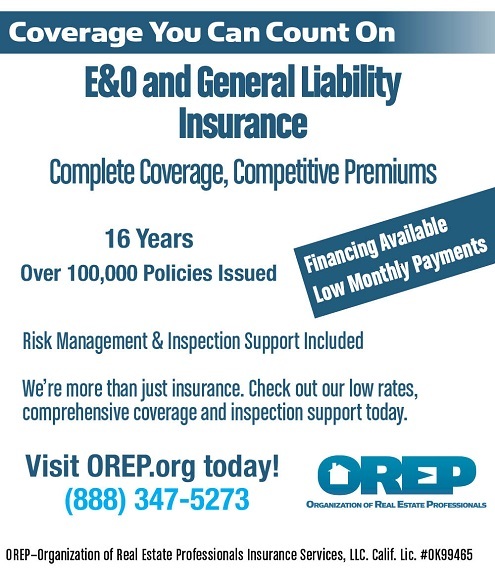 To contact Joe or if you’re an OREP member and would like the discount code, email Isaac@orep.org.